“Please” was the fourth single released to promote the album “Pop” in 1997. The commercial single was released at staggered times throughout the world in September and October of 1997. 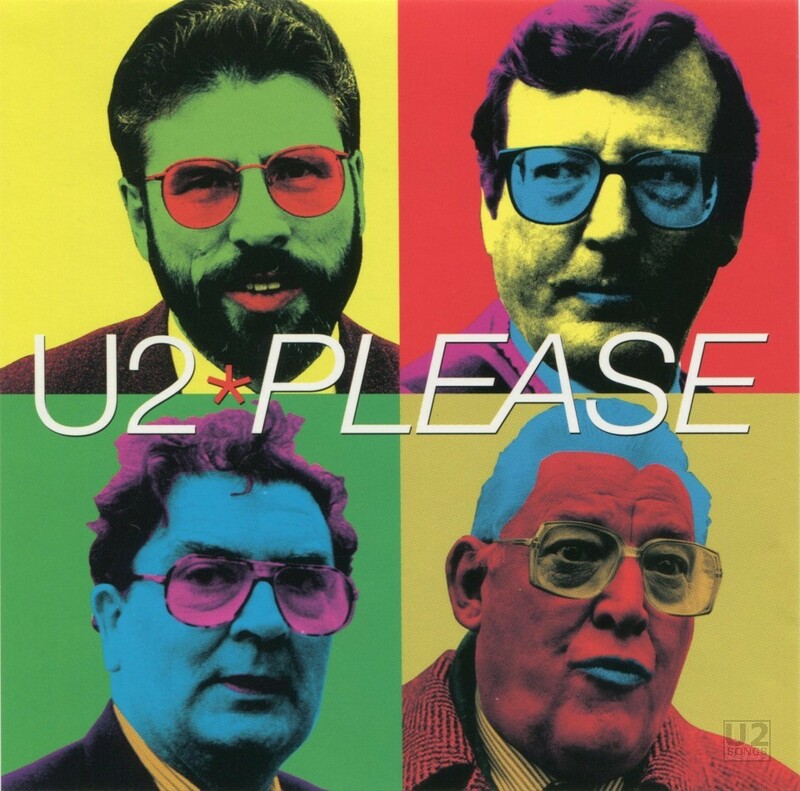 There were two commercial versions of the single, one which was titled “Please” and featured a cover with Irish politicians, and the other subtitled “Popheart EP” which featured live tracks. A number of promotional releases were issued for “Please”. The commercial single featured a newly recorded version of “Please” and not the version which was on the album. Two different edits of this new version of the song were created and used on promos – a “US Edit” and a “UK Edit”. These are not edits of the album version of the song but rather the single version of the song. A third edit, called a “Song Hook” is just a 12 second piece of the song which could be used for radio promotion. A 7-inch promotional single was pressed on vinyl for use in juke boxes. The single was pressed in France, but distributed throughout Europe. The single is black vinyl, with a silver molded label, instead of a more common paper label.The 7-inch vinyl contained the single version of “Please”, newly recorded for the single release, as well as the live version of “Where the Streets Have No Name” taken from a concert in Rotterdam, The Netherlands on July 18, 1997. On the 7-inch the title track is called the “Strings Version”, however this is the same as the “Single Version”. There was no 12-inch promotional single released for “Please”. A number of 5-inch CD promotional releases were issued. In the UK there were two discs issued. The first contained the “US Edit” of the song, as well as the “Song Hook”. This version was released in a slimline case with full colour insert. The US Edit is marked as being 3:47 in length on this CD but in reality it is 3:59 like in other pressings. This version had the catalog number CIDDJ 673. A second UK promo featured the catalog number PLEASECD1, and contained the “UK Edit” and the “Single Version” of the song. This second CD was also issued in a slimline jewel case with full colour insert. There were other versions of the CD used for promotion where the commercial CD was taken and altered to be used for promotional use. In Japan this was done by taking the commercial single and printing “Sample” in the middle of the disc and covering the UPC with a sticker. In North America, some copies of the commercial CD were stamped with a gold stamp that stated it was a promotional item. There were three different 5-inch CD singles for promotion in the USA. The first of these contained the “Single Version” of “Please”, as well as the “Live from Rotterdam” version and the “Album Version” of the song. The “Live from Rotterdam” version used on this disc was a slight edit to fade out the track, unlike the commercial version where the song goes right into “Where the Streets Have No Name” and thus no fade is needed. This was released in a regular jewel case with front and back inserts. The CD was yellow for this release. The front cover of this release has a very small “U2 * Please” across the front, where the second promotional CD for the US had a different front cover with a bigger font. The second promotional release contained the “US Edit”, the “Single Version” and the “Song Hook”. It too was packaged in a regular jewel case with full front and back inserts. The CD was red for this release. This release was catalog number PRCD 7679-2, however there was another release with that catalog number. This third promotional CD was issued without any front or back inserts, but with the same catalog number, PRCD 7679-2. The face of the CD had a very distinct blue paint job with pink swirls throughout. The font for “Please” itself on the disc appears to be handwritten. The only track contained on this CD is the “US Edit”. This unique pressing was pressed by The Sound Factory. It has been suggested that Polygram was looking at alternative production houses for there CD products and some promotions were sent to this alternate to their normal production house as a trial in 1997 including this pressing by U2. Produced by Howie B. Recorded by Mark ‘Spike’ Stent. Mixed by Howie B and Mark ‘Spike’ Stent. Assisted by Hans Bedeker and Evelien Tjebbes (Holland) and Rene Weis and Philippe Bouvier (France and Germany). String arrangement: Craig Armstrong. Recorded at Wisseoord Studios BV, Hilversum, Holland. Mixed in Le Voyageur II, France and Germany. Produced by Flood and Howie B. Recorded by Mark ‘Spike’ Stent and Alan Moulder. Assisted by Rob Kirwan. Mixed by Flood and Howie B. Assisted by Rob Kirwan. Inspirational Decks: Howie B. Organ: The Edge. Additional loops and kits: Larry Mullen. Keyboards: Flood. Music by U2. Lyrics by Bono and the Edge. Recorded live at Feyenoord Stadium, Rotterdam on July 18th, 1997. Recorded by Andy Rose. Mixed by Mark ‘Spike’ Stent. Where the Streets Have No Name (Live): Music by U2. Lyrics by Bono. Recorded live at Feyenoord Stadium, Rotterdam on July 18th, 1997. Recorded by Andy Rose. Mixed by Mark ‘Spike’ Stent.